When present day headless horseman Braeden Van Brunt meets the original Katrina Van Tassel, he cannot resist her pull on his heart, but her own heart may still be with his look-alike ancestor. How can he love a woman living in a different time period and put the past to rest, especially when the dead don’t rest in Sleepy Hollow? Author Note: Passion of Sleepy Hollow was previously published by Ellora's Cave in 2014. “Of course.” All bustle again, she moved to her chest and pulled out an old hairbrush. “Do you need it?” She glanced at his head. Puzzled, she started to obey. He stepped next to her and took the brush from her hand. “Yes, you can.” Without giving her a chance to think, he grasped the edges and lifted the garment over her head. She raised her arms and allowed him to have his way. She was all curves, and seeing them for the first time all at once was breathtaking. He moved the nightstand closer to the chair so the lantern would illuminate her clearly. Then he took her hand and guided her to sit, forcing himself not to touch all the places he craved. This was about her. Once she was seated, he moved the other lantern from the floor and set it on her bureau. When he turned back to look at her, she was bathed in a yellow glow. Her gaze met his and the uncertainty he witnessed made him want to crush whoever had made her think she might be anything less than gorgeous. He forced his body to relax. She could simply be shy. Best way to help that was to distract her. Without hesitation, he unfolded the towel from his hips and set it on the floor to the side of her. “Braeden.” The word was a whisper. 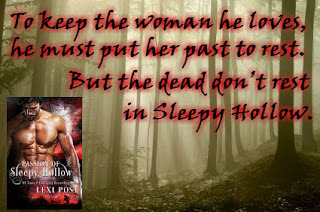 Thank you for featuring Passion of Sleepy Hollow!